It was a fun opening weekend of College Football. A lot of teams performed as expected while others surprised in the first action of the season. I’m sure many people expected perennial powerhouse Florida to manhandle Miami (OH). And while the final score would indicate such a beating was in order, Florida’s performance was far from dominating. The offense struggled in John Brantley’s first start under center. The Gators turned the ball over three times and only managed 26 total yards heading into the 4th quarter. Those stats should have me concerned, but I’m not. The fumbles appeared to be timing issues between Brantley and Center Mike Pouncey. Those issues can be cleaned up within a week’s time and I believe Brantley and the offense will have a better showing against South Florida this weekend. A team I am worried about though is Oklahoma. Sure this team put up 31 points this past weekend, but the Sooners defense gave up 421 yards of total offense against the Aggies. No disrespect to Utah State, but this team is not in the same league as Oklahoma. The Sooners survived a scare this time but next weekend they might not be so lucky. FSU travels to Norman after a successful showing against Samford. The Seminoles offense accumulated 481 total yards with signal caller Christian Ponder throwing in 4 touchdowns. A win against Oklahoma might be the thing that brings FSU’s Mojo back. This matchup should be one of the better games to watch in Week 2 action. Earlier I talked about how important it was that Michigan got off to a good start and I was really surprised they played so well against UCONN. This Huskies’ squad was coming off of an 8-5 season a year ago and is very experienced. Rich Rod has Michigan headed in the right direction but I was convinced key injuries on defense and questions of who would be the starter at QB would be too much to overcome in week 1, I was wrong. 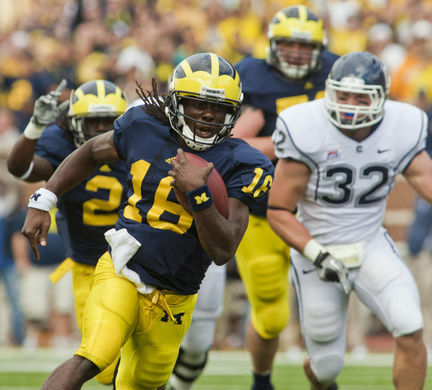 The Wolverines’ Denard Robinson looked impressive, to say the least. He went 19 of 22 for 186 yards and 1 TD through the air; followed up with 197 yards rushing and another TD on the ground. This Michigan versus Notre Dame matchup is looking like it’s going to be Must-See TV now. I really can’t wait to see this one!